The hut is approximately 18cm tall, 14cm wide and 14cm deep. 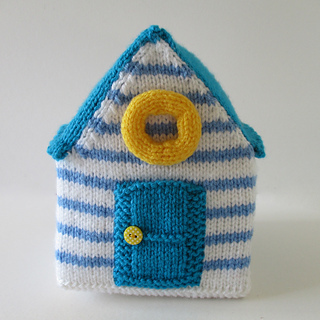 Bring some summer cheer to your home all year round with a knitted beach hut. 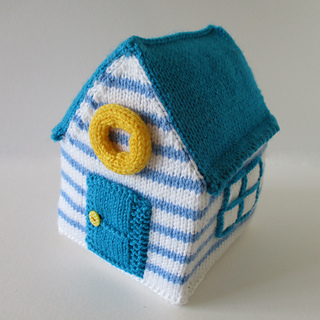 THE PATTERN INCLUDES: Row numbers for each step so you don’t lose your place, instructions for making the hut and photos, a list of abbreviations and explanation of some techniques, a materials list and recommended yarns. The pattern is 5 pages and written in English. 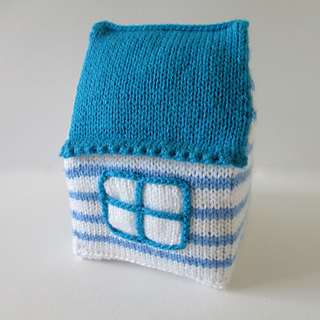 TECHNIQUES: All pieces are knitted flat (back and forth) on a pair of straight knitting needles, apart from the decoration on the window panes which is a single crochet chain sewn onto the window. You will need to cast on and off, knit, purl, work increases and decreases, sew seams and knit stripes (i.e. change colour at the end of a row). I have no objection if you wish to make these beach huts to sell to raise funds for charity. However please do not reproduce or sell this pattern.